Driven by an unstoppable proliferation of networked pocket computers, the dominant view of interaction between humans and machines turns towards the built environment. I want to draw special attention to these archaic, fixed structures. Sensor networks, actuators, selfregulating air conditioning, media facades, intelligent walls, cognitive radio and other embedded computational systems make buildings appear closer than ever to machines for living. Yet their deeply immutable character resists the urge to move, adapt and interact. Are we striving to change the nature of the home and the city? Or can this be a motive to rethink the notion of interaction? 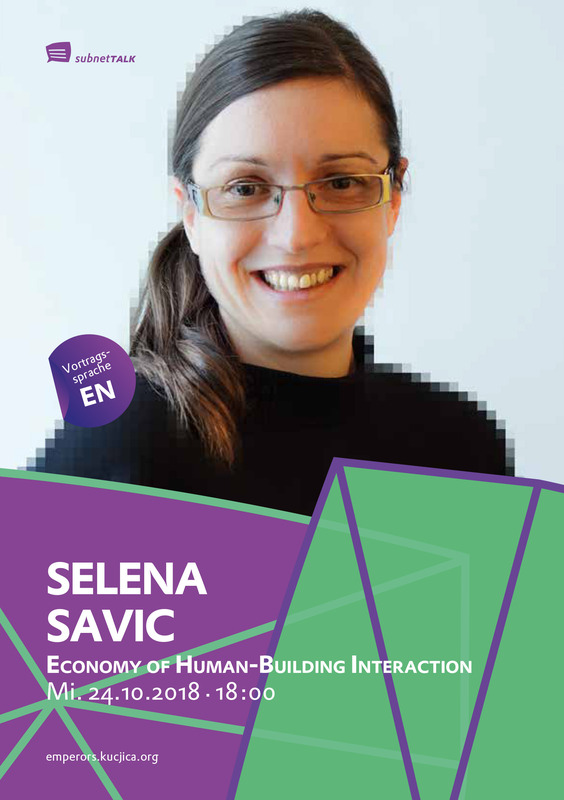 Selena Savic is a designer and researcher. She holds a joint PhD by EPFL in Lausanne and IST in Lisbon, with a background in architecture (Faculty of Architecture, University of Belgrade) and media design (Piet Zwart Institute, Rotterdam). She is currently a postdoc fellow at the department of Architecture Theory and Philosophy of Technics, TU Vienna, Austria. Her hybrid design practice forms productive connections between the world of tangible experiences and seamless technologies and infrastructures. She publishes extensively on the role of digital technologies and infrastructures in creation and organisation of space.